The Ministry of Education awarded the first ever Distinguished Taiwan Alumni Awards in October, 2018, to seven overseas alumni for their outstanding contributions in the fields of education, industry, and/or civil service. The award winners included Belgian sinologist, Professor Roel Sterckx, currently the Joseph Needham Professor of Chinese History, Science and Civilization at the University of Cambridge. Professor Sterckx graduated from the Sinology Department of the Catholic University of Leuven (KU Leuven) in Belgium in 1991 and then moved to Taiwan to further his studies of Classical Chinese and Philosophy at National Taiwan University. He subsequently settled down in the UK and undertook his Ph.D. at the University of Cambridge, where he became a teacher, fostering a new generation of sinologists. He helped to establish a Taiwan Studies programme there and is currently developing a new approach to learning classical Chinese. 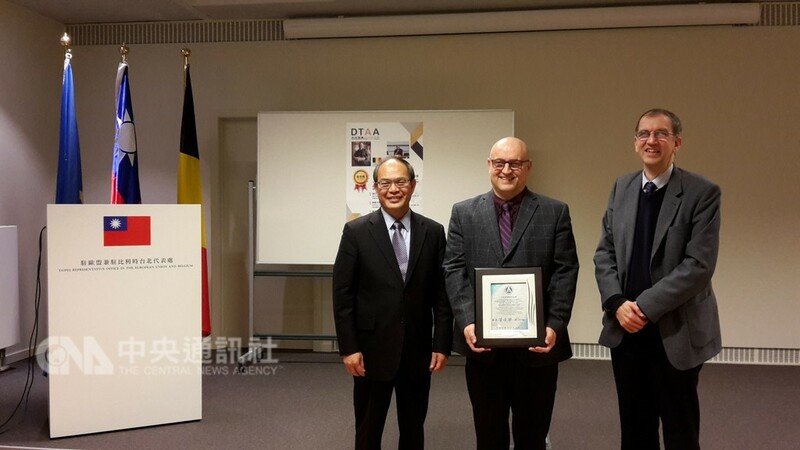 Professor Sterckx was unable to be present for the official award ceremony in Taipei on October 26 because of a previous commitment to lecture in the United States, so the Taipei Representative Office in the EU and Belgium organized an award ceremony in his honor on December 17, 2018. Representative Harry H.J. Tseng, presented the professor with the award on behalf of the Ministry of Education, and thanked him for his significant contributions to the field of Taiwan Studies throughout his career. Representative Tseng also encouraged Professor Sterckx to continue his research and teaching in order to let more scholars around the world know about Taiwan’s developments. During his acceptance speech, Professor Sterckx expressed his gratitude for the award and described Taiwan as a very unique and rich resource of cultural heritage for sinologists. He recalled fond memories of his time studying in Taiwan, including his shock at having to sleep in a 4-person dormitory room, tasting stinky tofu at the night markets, and the many valuable studies related experiences. Professor Nicolas Standaert, the head of the Department of Sinology at KU Leuven, attended the award ceremony for Professor Sterckx. He and his colleagues were deeply moved that such an honor had been bestowed on an alumnus of the university and felt that their students would be greatly encouraged and inspired. Although the Department of Sinology was established relatively recently – in 1979 – and has not had high numbers of students, it has nurtured many renowned sinologists who are now teaching in places spread all over the world, including the Netherlands, the United States, Canada, Hong Kong, and Macao. Professor Standaert, a distinguished alumnus of both KU Leuven in Belgium and of Fu Jen Catholic University in Taiwan, has continued to collaborate with Taiwan’s academic community since his time as a student there. Photo:(From left) Representative Harry H.J. Tseng, Prof. Roel Sterckx holding his Distinguished Taiwan Alumni Award, and Prof. Nicolas Standaert.